Business cards are very important need of a business and to collect them impressively, wholesale business card boxes are very important. 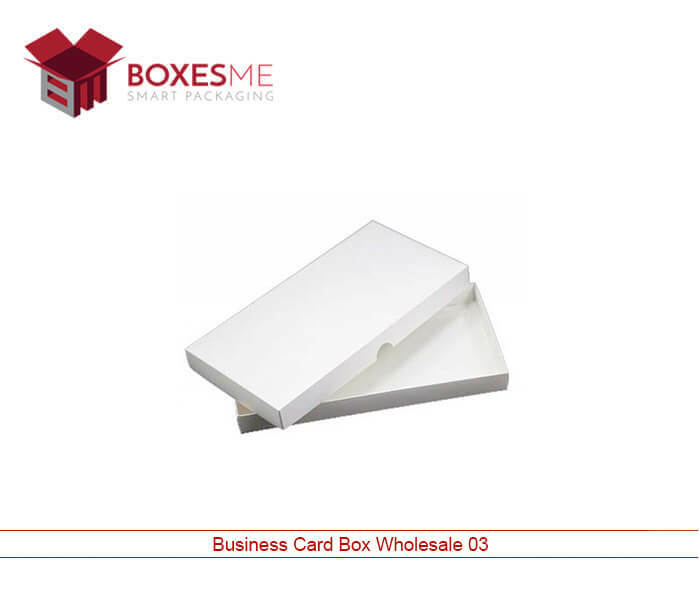 Business card boxes wholesale are best for keeping in the office table or for sending the cards after printing. These custom business card boxes are the only option by which you can send the cards to the businessmen as they provide protection as well security during the transportation. Other than that, custom boxes can be made in any shape, style and size according to the size of cards you want to keep. Which business cards boxes wholesale increase Profit and Popularity? Wholesale business cards boxes can impress the onlooker in a great deal. Business card boxes wholesale if placed on office table will look elegant and reflect the quality of your business. These boxes must be customized with printed brand name and logo to make them catchier. Premade boxes do not have the choice of printing, hence you cannot mention brand name. Other than that, you can add various finishing options on the box to make them shinier. Gloss lamination, matte finishing, aqueous coating and foiling options are the best add-ons to glorify the outlook of your box. As mentioned earlier, you can design the business card boxes according to the dimensions and size of the cards you want to keep inside. Stylish designs are made available to your for the designing of the business card boxes. Hexagon two piece boxes, 1 2 3 bottom boxes, tray and sleeve boxes and simple two piece boxes styles can be made to make them look unique. You can print the images of your most selling product in the business card to promote the business as well as the product. Stylishly designed boxes will make you proud of your business and help you grow with motivation. Business card boxes wholesale should be made of quality material so that the cards would not crumple during the shipping. 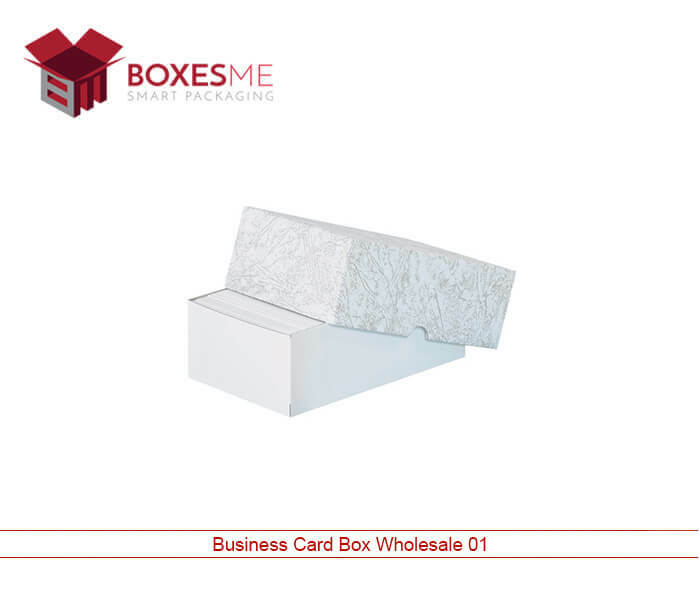 Wholesale business card boxes can be made from sturdy cardboard or corrugated stock that allow them to be used again and again for keeping the business cards. You can make these boxes with full colour printing and additional structural add-ons. Die cut window can add to the beauty of your business cards whereas the inserts inside will allow you to keep multiple sizes of business cards together. 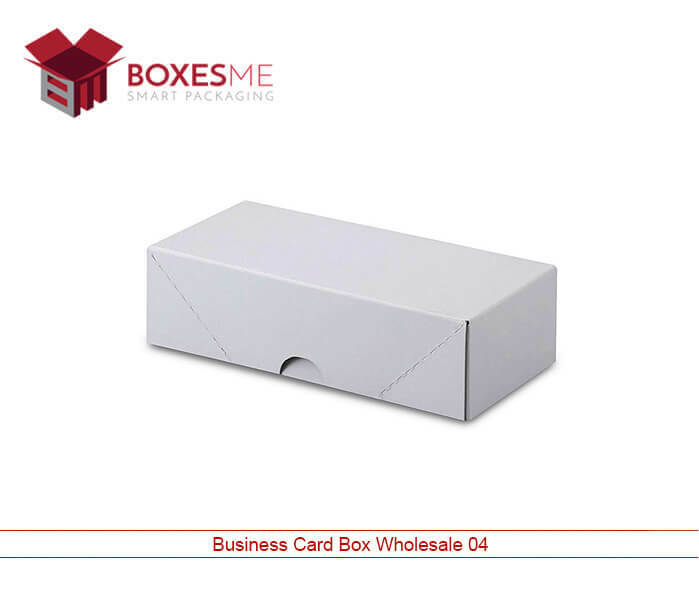 Why must you choose us for wholesale business card boxes? 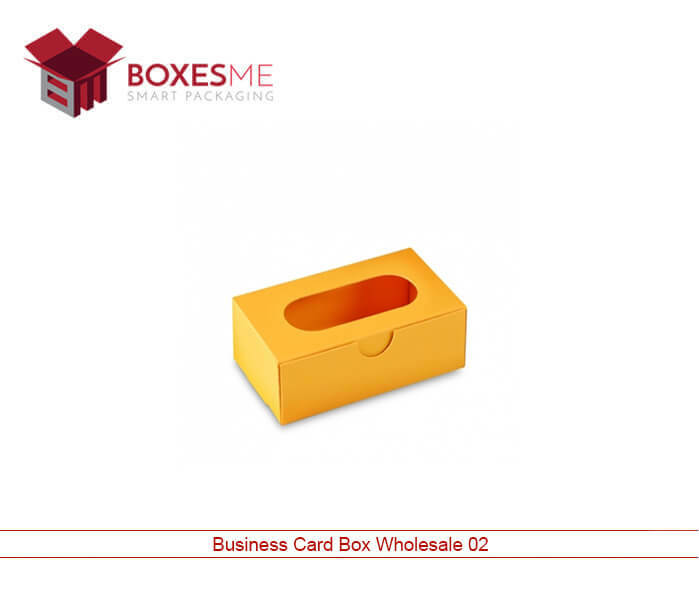 BoxesMe is one of the most experienced wholesale business card boxes manufacturers. Our designers help the customers in getting the most appropriate design of business card boxes wholesale. We provide free designing assistance to our customers and special discounts on wholesale orders. You can order any quantity of the boxes as we have no order limits for you.